Before living a Circular lifestyle, I was an extremely low maintenance lady on the body product front -I'd often forget to moisturize. Now that I make my own body products, I want to use them all the time, as they are clean, healthy, plastic-free, and work so well. I'm still low maintenance, but I can't help using my body lotion every single day! It's non-greasy, fluffy, and absorbs right into the skin. 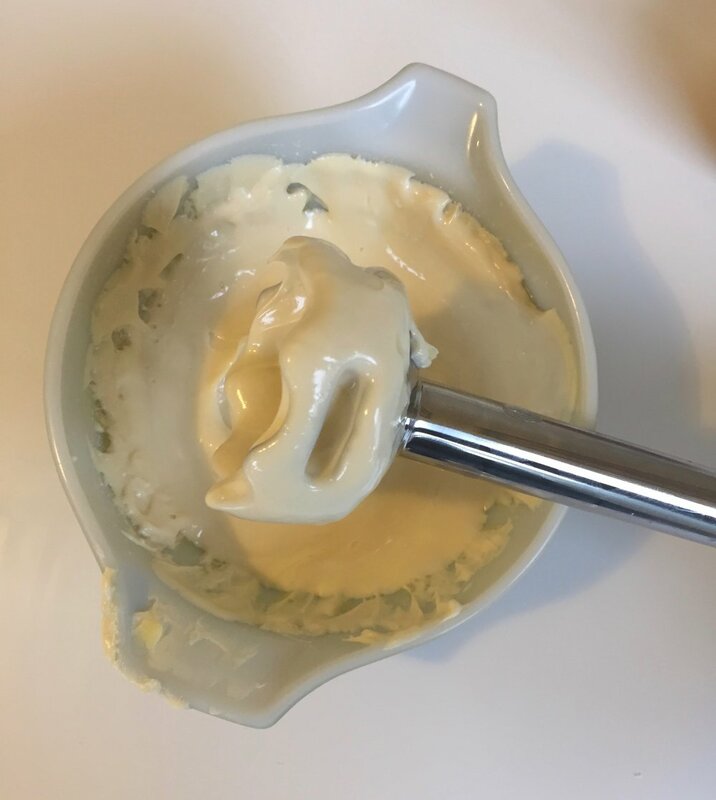 I also make a body butter, which I find more useful in the winter or when living in dry areas, as it locks moisture in by sitting on the skin and absorbs more slowly. To make this very straightforward body lotion I use an aqueous herbal infusion or herbal infused oil of comfrey, plantain, St. Johns wort, and calendula. I'm able to purchase these herbs dry and in bulk. If you don't have access to bulk herbs, you don't have to include them (the lotion will be just as fluffy and non-greasy, but without some of the healing properties of these herbs). You could also make an aqueous infusion with green tea, as it has antioxidant properties, or chamomile, which has calming properties. To make an aqueous infusion, simply mix 1/4 cup of each of the herbs together, put them in a muslin bag inside a pot, pour boiling water over the pouch, and put the lid on the pot. It's like making tea that you don't drink. Let it steep until the the water is dark from the herbs (20 minutes). Set the aqueous infusion aside and compost the herbs. There are several ways to infuse oil with herbs. I prefer the cold pressed way, which takes the longest. Place your herbs in glass jar and cover with a carrier oil (olive, jojoba, avocado oil, etc.) Let the infusion sit in a sunlit window for 6 weeks. Shake the jar once per day or when you remember. When the infusion is done, strain the oil and compost the herbs (you may also be able to use them in soap making instead of composting). Decide whether you want to use an aqueous infusion or oil infusion, or neither before you begin making this recipe. Note: The beeswax, carrier oil, and cocoa butter once melted need to equal 3/4 cup. This might mean adding a little bit more carrier oil, as the beeswax and cocoa butter melt down to approximately 1/4 cup. Do not add more beeswax or cocoa butter. Note: I use Ylang Ylang essential oil for this recipe, but other nice ones include: jasmine, rosemary, lavender, lemon, sage, and spearmint. The Steps: 1. Make 3/4 cup aqueous infusion of herbs. I like to use 1 cup hot water to steep, as some of it will be absorbed into the muslin bag, leaving you with approximately 3/4 cup. 2. 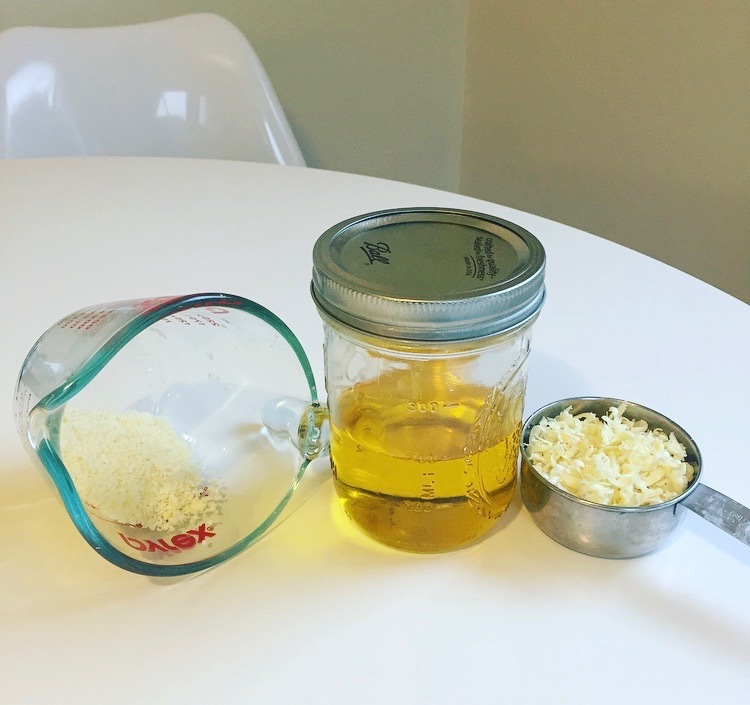 Combine the cocoa butter, carrier oil, and beeswax in a glass measuring cup or pyrex bowl. 3. Place the measuring cup or bowl in a pot of boiling water and melt the ingredients until completely translucent. 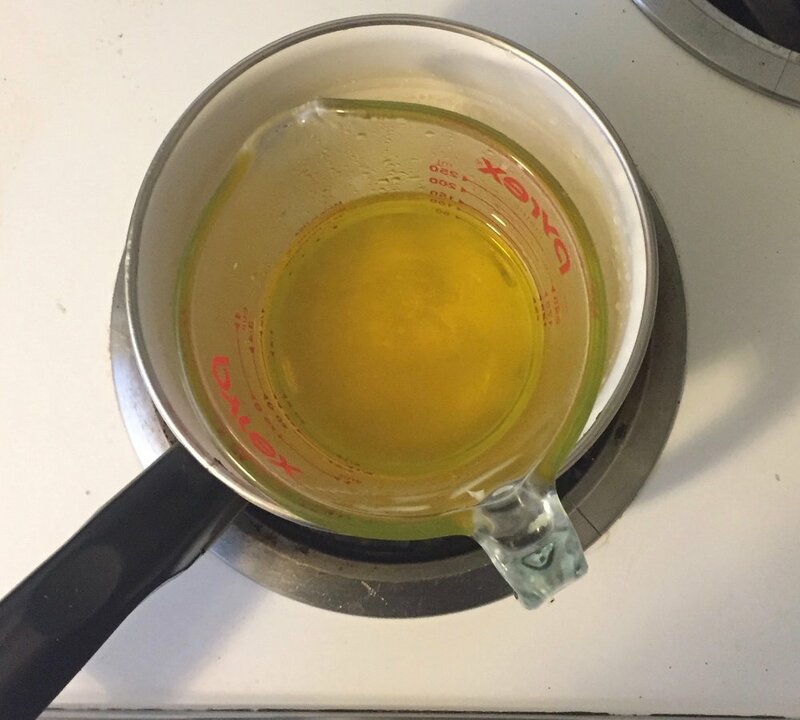 Add more carrier oil to your glass measuring cup or bowl if needed to reach the the 3/4 cup line (I like to melt my ingredients in the glass measuring cup, which makes it easier to measure). 4. While your ingredients are melting, combine the vitamin E oil, arrowroot powder, and mix until they form a crumbly paste. 5. Remove the melted ingredients from the heat and stir in the crumbly paste and essential oil quickly, as the mixture will be cooling. 6. Pour the mixture into a blender or take out a blending wand. 7. Once the ingredients have slightly cooled around the edges, but there is still liquid in the middle, slowly begin adding the 3/4 cup of tea or warm water while blending. 8. Keep blending and emulsifying the ingredients until you have a creamy, fluffy lotion in front of you. You can stop and test it, and then see if you want to mix it a little more. 9. Scoop your lotion into a jar and enjoy! Arrowroot Powder: Arrowroot powder is used as a thickening agent. It soaks up oil to help keep the lotion non greasy and is easily absorbable by the skin. Cocoa Butter: Cocoa butter is a vegetable fat rich in antioxidants. It can help prevent wrinkles, reduce inflammation and visible scars, as well as improve skin moisture and overall skin health. Vitamin E Oil: Aside from being a natural preservative, Vitamin E oil is very healing, is rich in antioxidants and is extremely moisturizing. It has also been known to reduce wrinkles. St. Johns Wort: Can help relieve soreness in the body, muscle pain, and first degree burns. Plantain: Supportive for minor skin irritations. Plantain has also been used to eliminate skin blemishes. Calendula: Calendula is a wonderfully soothing and is very supportive in creating healthy skin for those who suffer from a variety of skin conditions. It can also aid in the healing of bruises, insect bites, cuts and scrapes. Comfrey: Comfrey has anti-inflammatory properties and can alleviate pain from insect bites and various skin conditions. Comfrey contains Ascorbic acid, which when applied topically, can improve immune health by stimulating the the production of white blood cells. Comfrey has also been used to reduce muscle and joint pain. Ylang Ylang Essential Oil: Smells amazing and helps relax the mind and body. The lotion will only last about 15 days unrefrigerated. I recommend storing it in the fridge to avoid it spoiling.